Do you need secure watertight storage? Than look no further. Our 40ft Storage Containers are great for construction sites, inventory overflow, farms and temporary “on-site” storage of all different kinds. A 40ft container is comprised of 14-gauge corrugated steel panels throughout. They have lockable double doors on one end that are equipped with our “easy open” door handle. They also have 1-1/8″ thick marine plywood flooring on the interior. 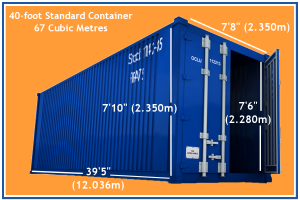 Affordable Space Storage has 40ft storage containers ready to deliver to you today.